So, we all basically agree that homelessness is an issue. And it is worldwide. But personally I do rarely think about it. And I’m sure that few of my peers think about that on a daily basis. And during my research for this article I figured that homelessness is real problem that we should think about, because this can happen to literally anyone. But first things first, to talk about homelessness as an issue we need to define what homelessness is. While researching, I found out that there are two ways of living without actually having an established place that belongs (de jure) to you and only one of them is real homelessness. We all know about the type of people who so desperately need to not to be bonded, attached to something and are in huge need to be free that they choose to abandon their dwellings and go into the nature living for the better connection with The World. 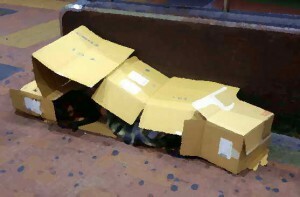 And if you might think they are homeless, it occurs that apparently, they aren’t. They live their free happy life and content with it so they aren’t actually counted within term ‘homeless’. The ones who are counted possess some common features that unlikely to be desired by any person. According to various sources homeless person is a person who has no regular dwelling or the person who’s dwelling conditions are not safe, secure and/or adequate. • an asylum seekers, refugees or people from abroad. Facing so many categories of people personally I start to wonder why there are so many of them? Do they deliberately choose to be homeless or what? After doing some research on that matter I can assure you – they don’t. Well, they kind of do but I highly doubt that it can be actually counted as a choice. Most of the people who end up being homeless are making that decision in order to save their lives or have no other option, so don’t tell me ‘life or death’ situations can be legitimately called ‘a deliberate choice’. Most of known homeless people in Ukraine are people who somehow lost their homes due to personal problems, theft, addictions, low social life level or mental illness. And here it comes the policy of security theater. Because as there are some known amount of people who are affected by homelessness, there are also so many that we dont know about! People who need just a slight push to improve their situations, teenagers that escaped from the dysfunctional families, those who lost their jobs or housing, and even more people now due to the armed conflict at the east. And the worst problem is that no-one seem to even care to help them. In countries like United States, Australia or United Kingdom there are programs, shelters and kitchens that built and established in order to provide homeless people and encourage them to try to rebuild their lives. But in our country there are just neglection and disgust. And when most of civilized world is on its way to solve the troublesome issue (which actually CAN be solved) we make the problem even more severe with unawareness and disguise. Of course, comparing homelessness in USA and homelessness in Ukraine we can find some major differences but the key point stands straight: the largest amount of people are homeless because they are not protected by society. So why do we need to solve this problem and how do we do that? First of all, let me tell you why do we need to do something and do it quickly. Its because of people. Each day more and more people become homeless due to various reasons but now it is even harder because of armed conflict at the east and being people they all have coping strategies. The most common strategy for all the people is to accommodate. A person can and will fight for accommodations only for so long after a while it becomes urgent to fight not only for comfort but for basic needs. And when you faced with the cruelty critical conditions how long will it take for you to give up fighting and start surviving? This issue is important and not only to homeless people but for everyone in our society. We need to admit its existence and change the general attitude of common people towards the issue. Because our neglect can and most certainly will cause harm to our society. People who became homeless didn’t choose that way of living and I highly doubt that they will continue living like that if they would have the alternative opportunity. As we claim to be high society with moral norms and great standards, shouldn’t we pay more attention for those outside who cant support themselves? And taking into consideration the general for all human being tendency to get used to surrounding conditions and accommodate to the situation we are all in risk of losing completely sane and capable human beings due to some harsh life situations instead of helping them out of the crisis and letting them be useful for society and develop their potential. So does our security theater worth ruining so many lives by doing nothing? I highly doubt that. And, in the end, talking about solving the homelessness issue there are, in fact, ways to succeed. In Utah USA was created program housing for homeless. People get flats for free and either get jobs or just continue living there for as long as they want. It reduced number of homeless for 78% from 2005 to 2014. So we can help. And, maybe, we should? This entry was posted in Social and tagged homelessness, moral, norms on 30/03/2017 by Mary.